ProximaRF Technology Corp., manufacturer of RFID readers and reader modules with applications in forest fire early warning sensor systems, announced its ProxFire Detection System was featured in a controlled burn test in Castaic, Calif. Temperature sensitive, lightweight sensors carrying RFID technology are triggered by heat generated from a developing fire. This transmits an alarm signal with a unique code a wireless gateway in range of the signal, which then relays the alarm to a central location such as an operations center for fire response and management. 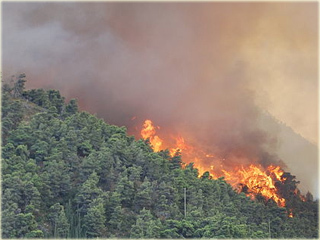 ProxFire Detection System supports early and rapid response protocols, thereby greatly reducing the potential for damage to the environment and property, loss of wildlife and its habitat, and loss of human life. In partnership by the U.S. Forest Service and the Los Angele County Fire Department, four experiments were conducted during the live burn including dozer burnover, structure protection wrap, vehicle tracking and early detection systems.